(Minghui.org) Since last December, 6820 people from Ruanjiang City, a relatively small city of only 740,000 in Hunan Province, China, have signed a petition to support the lawsuits that are being filed by Falun Gong practitioners against former Chinese dictator Jiang Zemin. 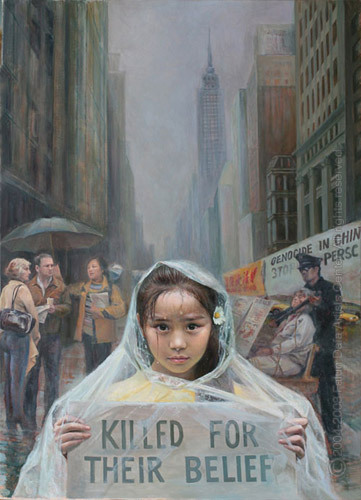 In 1999, Jiang Zemin, as head of the Chinese Communist Party, overrode other Politburo standing committee members and initiated the violent suppression of Falun Gong. Chinese law allows for citizens to be plaintiffs in criminal cases. More than 200,000 practitioners have exercised that right and filed their criminal complaints against the former dictator. Falun Gong’s peaceful resistance is widely supported at the grassroots level in China and by politicians, opinion leaders, and human rights activists all over the world. In Asia alone, more than 1.2 million people have signed the petition, calling on China’s legal system to investigate Jiang’s crimes. More than 6000 Ruanjiang residents have signed to show their support. Many people believe that Jiang Zemin has brought disasters to China and that it is a huge crime to persecute a peaceful group that follows Truthfulness-Compassion-Forbearance, which is why they agree that he must be brought to justice. (Minghui.org) On May 9, at a council debate, David Shoebridge, John Kay, and Jan Barham, three Greens members of the New South Wales Legislative Council, submitted a petition with more than 100,000 signatures to the council. The petition calls for action to be taken to stop the Chinese Communist Party (CCP) from harvesting organs from Falun Gong practitioners, to make laws to forbid Australian citizens to have illegal organ transplants in other countries, and to stop training surgeons from other countries for illegal organ harvesting. The call for the end of organ harvesting in China is strongly supported by medical experts. On May 8, Jeremy Chapman, Director of Acute Interventional Medicine (SWAHS) and Renal Services at Westmead Hospital, President of the Transplantation Society, Immediate Past President of the World Marrow Donor Association, and Chair of the Global Alliance for Transplantation, gave a briefing at the state Parliament House, titled “The Declaration of Istanbul: The professions’ response to human organ trafficking.” He asked lawmakers to take action to stop this illegal and immoral business. At the press conference on the 9th , Mr. Shoebridge mentioned the support from Prof. Chapman. He said: “Professor Chapman is not in particular a friend with Falun Gong, he is not in particular a friend with the Greens, he is not a particular friend with anyone in politics, but Professor Jeremy Chapman is the most learned surgeon on transplantation medicine in Australia, probably one of a handful of people who know more about the way international transplantations work, than anyone else on the globe. Mr. Shoebridge said: “We need to ensure two things. First of all, we work on those international human rights issues, we pass laws to stop our citizens going to other countries and exploiting prisoners of conscience in China, people in great poverty in Pakistan, India or Columbia. We need to stop that happening internationally. The bill that I brought before the House is part of that, part of international responses for that. But we also need to work at those principles.